Michael is actually a cyborg, with the only human parts being the head and the flesh. 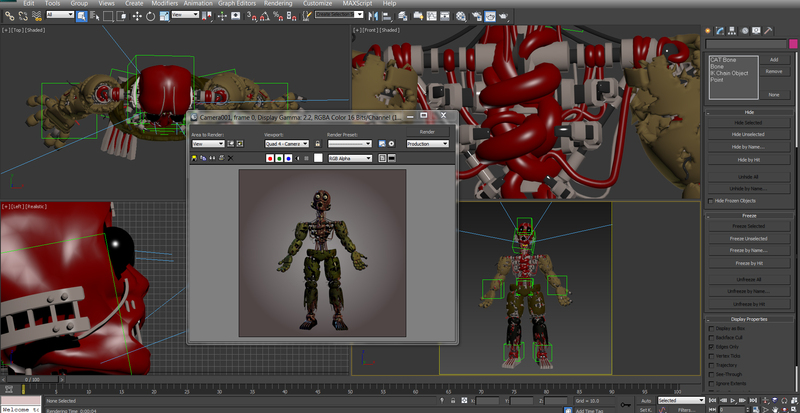 What we see in Springtrap, is not the springlock endoskeleton, but Michael’s own skeleton. There’s undoubted proof for this, the sound of the Scooper when it hits Michael, it’s not just a “splotch”, the sound of viscera, there is as well a sound like a “clank” as in the scooper has hit something metallic. Scott mentioned about the Scooper that it works removing the internal organs, but in its path, there are the ribs, and when the Scooper hits Michael’s ribs, it makes that mechanical sound. This explains some curious things we see in the next linked image, like guts intertwined around the endo, which would be impossible since the springlocks cuts into the guts. What there are inside them are different sized skeletons for her, because she needs to grow, but can’t because of the nature of her own body.